This report is Arts Council England’s second contribution to strengthening the evidence base for engagement in the arts, health and illness.. In August 2004 ACE published a review by Dr. Rosalia Staricoff of the medical literature on arts and health, which demonstrated some of the powerful outcomes of introducing the arts into healthcare settings. Reports an analysis of health data gathered as part of Office of National Statistics surveys of attendance and participation in arts activities undertaken in 2001, 2002 and 2003. Nearly three out of 10 of the people surveyed reported a longstanding illness or disability. Of these had an illness that limited their activities in some way. People with a limiting longstanding illness were less likely than people with no longstanding condition to: attend any type of both performing or non-performing arts or culture and participate in any sociable or dance activities. People with better health were more likely to: attend performing arts events, attend non-performing arts or cultural events or venues, participate in dance activities and access the arts through media. Windsor, J. (2005). 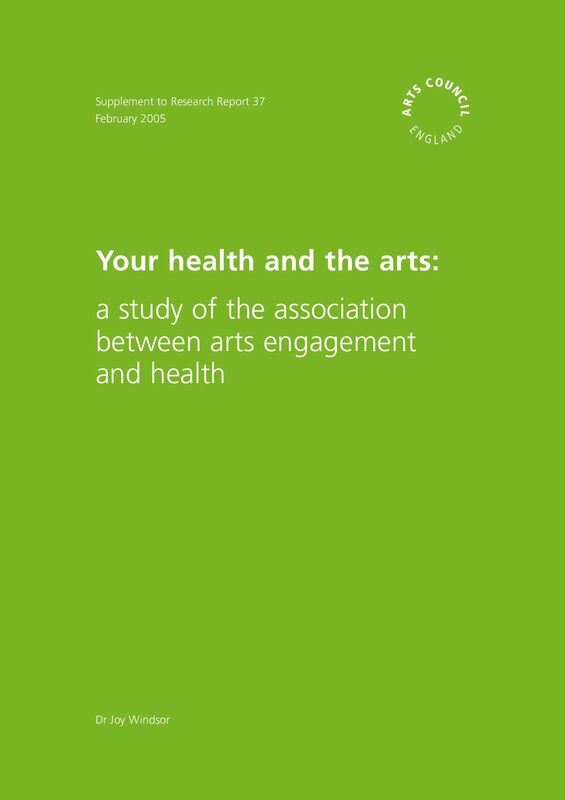 Your health and the arts: A study of the association between arts engagement and health. London: Arts Council England.